The main objective of this research project is to measure the availability, continuity and accuracy of GPS vs. GPS + EGNOS in all FinnRef GNSS stations during a one-year time frame (2015-2016) as well as preparing for continuous monitoring of EGNOS performance in Finland. The European Geostationary Navigation Overlay Service (EGNOS) is the first European operated satellite navigation system and is a precursor to Galileo, the full Global Navigation Satellite System (GNSS) under development by Europe. At present, EGNOS augments the US GPS satellite navigation system and makes it suitable for safety critical applications such as flying aircraft or navigating ships through narrow channels. EGNOS can also support new applications in many different sectors such as agriculture (for high-precision spraying of fertilizers), transport (enabling automatic road-tolling or pay-per-use insurance schemes)  or even precise personal navigation services for general and specific usage. Finland being a high latitude (>600 N) country, the availability of EGNOS GEO satellites are always very challenging due to their very low elevation angles. Finnish Geospatial Research Institute (FGI) at National Land Survey of Finland (NLS) has been maintaining 20 permanent GNSS reference network stations all over Finland. The objective of this project is to monitor and analyze the performance of EGNOS in all those reference stations 24/7 in order to clarify that the EGNOS system performance reaches its target, also in Finland. FGI is the only public entity in Finland that has both the necessary infrastructure and knowledge for monitoring EGNOS performance. This undergoing experience and knowledge would give the opportunities to identify weaknesses in EGNOS system performance, especially at high northern latitudes. The outcome of this project will eventually be contributed to the future improvements of EGNOS, especially if we think of the expected performance and the promise of EGNOS in the north arctic area. The European Geostationary Navigation Overlay Service (EGNOS) is the first European operated satellite navigation system. 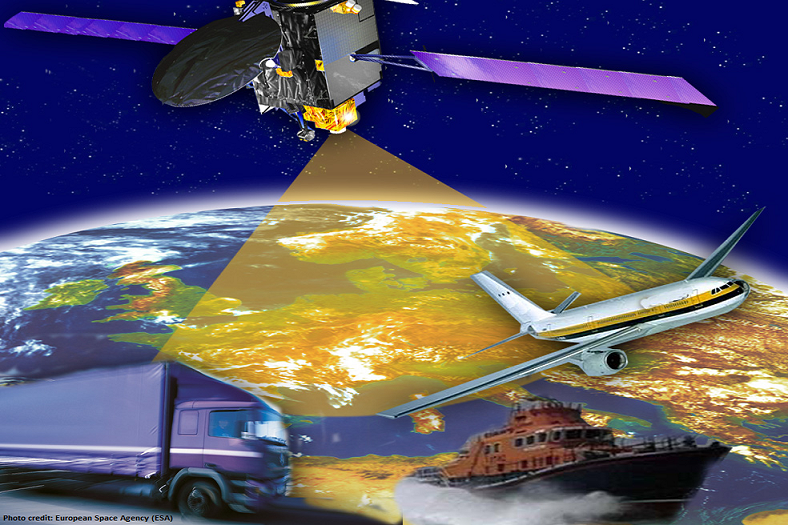 At present, EGNOS augments the US GPS satellite navigation system and makes it suitable for safety critical applications such as flying aircraft or navigating ships through narrow channels. EGNOS can also support new applications in many different sectors such as agriculture (for high-precision spraying of fertilisers), transport (enabling automatic road-tolling or pay-per-use insurance schemes)  or even precise personal navigation services for general and specific usage. EGNOS infrastructure comprises a ground network of 39 Ranging and Integrity monitoring stations (RIMS), 6 Navigation Land Earth Stations (NLES), 2 mission control centres and 3 geostationary satellites with signal transponders . 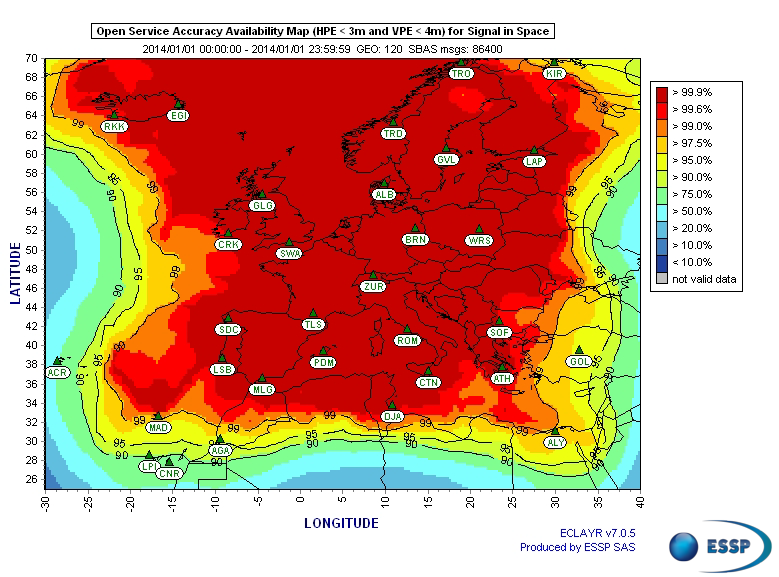 The EGNOS availability map for Open Service (OS) area is shown in Fig. 1. EGNOS transmits a signal containing information on the reliability and accuracy of the positioning signals sent out by GPS. It allows users in Europe and beyond to determine their position to within 1 to 2 meters and is available more than 99 percent of the time . The EGNOS OS has been available since October 1, 2009 . Its positioning data are freely available in Europe through satellite signals to anyone equipped with an EGNOS-enabled GPS receiver. The EGNOS Safety of Live service has been officially declared available for aviation on 02 March 2011 . Space-based navigation signals have become usable for the safety-critical task of guiding aircraft – vertically as well as horizontally – during landing approaches. PEGASUS Software User Manual, EUROCONTROL, version 01-Q, 29/09/2003. Navstar GPS, “Global Positioning System Interface Control Document, IS-GPS-200G”, 5th September, 2012. European Commission, “Galileo Open Service, Signal in Space Interface Control Document, (OS SIS ICD)”, Draft 1.1, September 2010.